The kid inside of me likes toys! Every kid likes toys. Some of these kids like characters so much they grow up to become storytellers who will create more characters. Some of them will become comicbook creators. And all of them would love to see their characters become little toys. 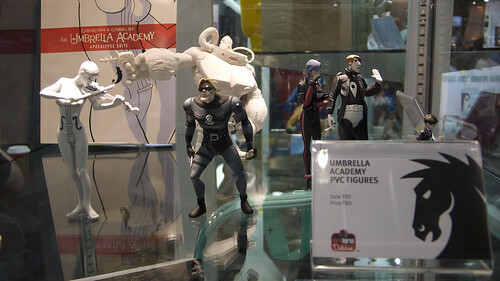 As noticed on the site TOYSREVIL's I like Toys, there have been spotted at this year San Diego Comic Con prototype PVC figures of Dark Horse's UMBRELLA ACADEMY. I've been following and aproving every step on the process of making this set and we're all very happy with the results. 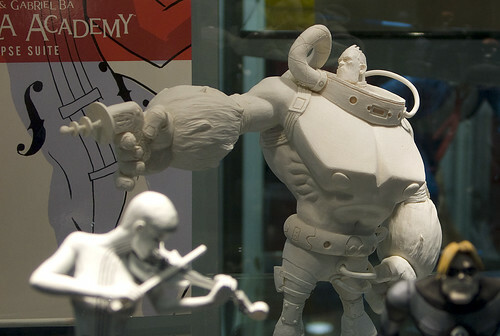 Soon, all of us will be able to have a litlle set on our shelves at home. Soon, the little kid inside of me will be a very happy kid. There are some reasons to why Bá and I are not drawing Marvel and DC super heroes. One of them is our own feeling we are not fit for it (which is strange, as I thought I wasn't fit for Casanova in the first place either). Production on the second volume continues steady and on schedule. We're a little bit late on everything else, but it's only for one more week. We can't all be drawing machines like Becky, now can we? If you still haven't hopped on the PIXU ride, you can get your copy online at Khepri.com. Trust me, you'll want to know what happens before PIXU II arrives. Back on the horror track! The response for PIXU has been great and that helps us continue on the horror path we created. 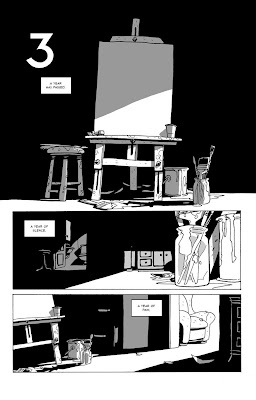 We were eager to be drawing again, and I think every time this happens with an artist, it shows on the first pages that come from this creative hunger. The best thing about having a working routine and a daily output of work is the constant feed we get from finishing a page, a feed that only enlarges our hunger and leaves us always wanting more. 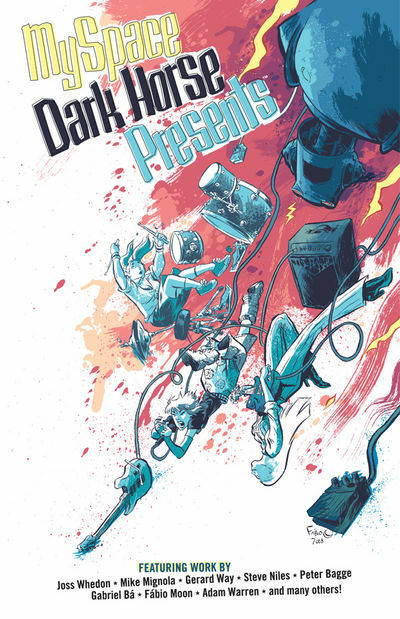 My Space Dark Horse Presents Vol. 1 will finally put on paper my Sugarshock story and it will be out in September. Before the San Diego Comicon, they were advertising the book with my first page as the cover, but I was asked to do a brand new cover for the first volume of the anthology, which they had on display at the convention. As I just wrote earlier today, doing covers is completely different than doing comics, and you can play on a completely different set of rules. I had fun doing this cover and I hope you like it. This November, The Umbrella Academy will return in another 6 issues mini-series. Bá is already drawing it, the first issue is ready and now he's taking over the cover chores. For a bigger version of the cover, click here. Doing covers is very different than drawing stories and pages, so Bá is going to try different things on the covers. I had more fun drawing this preliminary sketches than drawing the cat on the actual story, which was just a one page story. Now I want to think of other stories, even if just as short, and make the cat appear again just so I can draw him some more. 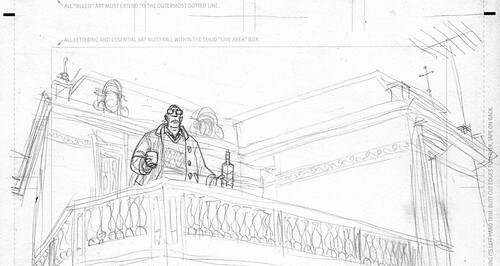 Today, we finished the breakdown of one issue of Daytripper. Bá is already moving on his Umbrella chapter, and we're trying to get as many PIXU pages done as we can before things get crazy once the BPRD 1947 arrives and we have to do it all at the same time. When we're this busy, working like crazy, staying awake around the clock, we sometimes wonder "why comics?" Why do we have this need? What drives us? What drives anyone to go out there and do comics, out of all things? And then we started asking around. Vote for the Harvey Awards! Deadlines for voting for the Harvey Awards are due to August 15th. The ballot is available as an Adobe PDF document or text from www.harveyawards.org. Email ballots, using the text file, can be emailed to pjcjmc3@sbcglobal.net. Paper ballots can also be mailed via US Postal Service or sent by FAX to those without Internet access - please call the Baltimore Comic-Con, host of the awards banquet and ceremony, at 410-526-7410 to make a request. Final ballots are due by midnight, Friday, August 15, 2008. We got 3 nominations for the Harvey Awards 2008. Home. Here we are, and we're safe, and we're happy. And busy. We've been busy for a long time. We were very busy during the convention, as we were on previous years (maybe more), and being busy is a good sign, is a sign we're working, we're building something that hopefully will stand the test of time as worth of the reader's time. We work because we feel this need to tell stories, and being busy is a way of knowing that stories are being told. This year, above all, I felt that not only stories were being told, they were being read as well. We work our best, but the job is only done when we find our readers, when they do their part, when they get the books and read the stories. Maybe they'll like it, maybe they won't. Every year, as we work more, I think it becomes easier to find our stuff and to read our stories. Having a body of work certainly makes it easier to be seen in this sea of artists and that's something most people don't realize. Doing comics is not easy and more often than not there are no overnight successes. It takes a long time, it's a long road, and you have to love it. I still can't believe we won. It's overwhelming, it's flattering, it's unbelievable and, at the same time, undeniable. I remember well that, during the ceremony, I completely forgot to thank anyone, so say anyone's name, or to express my gratitude for these awards. I was holding myself from bursting into tears, I was high of happiness, and I was pumped by my love of Comics. From that moment on, all I could think of was how bad I wanted to do more comics, and I hope that's the effect these awards have on people: this is it, you won, now get back to work and do it better, do it harder and do it for as long as you can. No words can really say how it feels, or how it felt for me, so I just want to work an keep doing what I love, and what it seems people also love, and have the work be my way of saying thanks. It's great to belong. It's great to have friends. Nobody is an island, we were not made to be alone, and it's great to find people who can take this great trip along with you, people who share our love for comics, people who also want to do their best, who don't settle, don't give up and they always want to do more, and do it better. These are great friends to have and I wouldn't have it any other way. On the plane back, I started drawing. I couldn't help it, I couldn't wait any longer and I just did it, between the first and the second movie on the second and longer leg of my trip, and it was great. It's great to draw, to create and to share. I inked the drawing when I arrived home, 'cause the plane was too shaky. 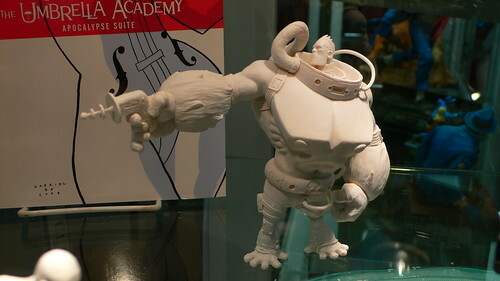 I knew this drawing world need good inking, 'cause these are friends you have to treat well. They're great, and I miss them already. We have a second PIXU to finish now, and just too much more to list at the end of this narrative, and we just can't wait to get to it. We love comics, and we thank all of you for your tenderness and support.